Your bus picks your private group about 10 am depending on traffic situations from your hotel in Los Angeles. Spend 4 – 5 hours seeing the city’s highlights with your group and enjoy the city of Los Angeles. Look for your favorite celebrity’s star on the Hollywood Walk of Fame. 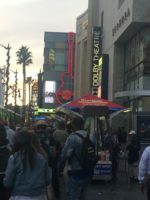 See Madame Tussad’s Wax Museum, Hard Rock Cafe, Dolby Theater the new home of Oscars and many other fun attractions along world famous Hollywood Boulevard. Enjoy complimentary snacks and bottled water. Go inside Griffith Park, one of the largest urban parks in North America, looming high above Los Angeles. Stop to take pictures in front of the Hollywood sign with incredible city views. Drive by Beverly Hills, Bel Air, and celebrity mansions. Ride over to upscale Rodeo Drive and stop wherever you like to browse or shop. See Santa Monica Pier with its amusement park rides, midway games, and seaside shopping. Proceed to the historic Venice Beach boardwalk with its colorful shops, hippie surfer vibe, and skate park. Before returning to your departure point, Circle through Downtown and see the stunning architecture of Disney Concert Hall, as well as the Staples Center, the famous home of Lakers. The tour can take from 4- 5 hours depending on the stops requested. Your round trip hotel transport, snacks and water are covered. Snacks and $5.00 Subway Gift Card give on the tour as a complimentary. Refund Policy: The tour is non refundable once booked.